To globally reinforce women as the change makers of modern society. 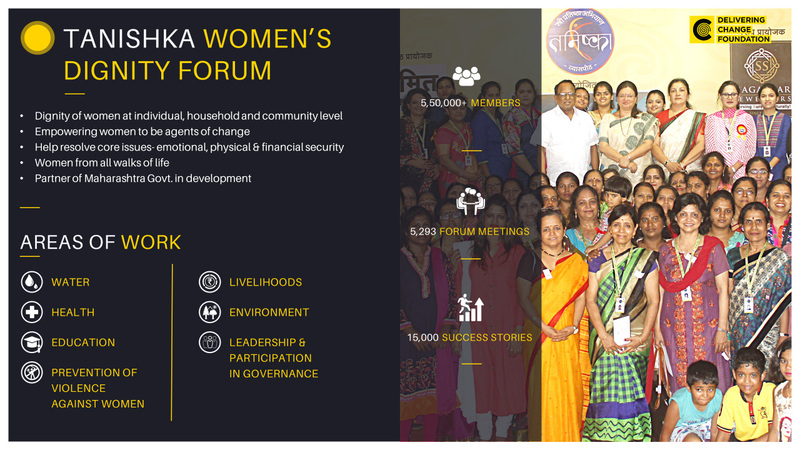 The Tanishka Foundation is a symbiotic network of voluntary forums that works towards restoring the dignity of women at the grassroots level, through social, physical and financial security. The Tanishka Foundation aims to encourage and energize women with a thought for social good and a sense of national pride and integrate them as change agents at the ground level. The distinct feature of Tanishka Foundation is to place women at the center point of nation transformation, thus assuring them of utmost dignity in human society. The aim of Tanishka Foundation Mexico, a social program initiated via The Women’s Project (TWP) Foundation created by Elisa Salinas, is to promote socio-economic transformation through women, giving them a place of honor and respect. It is a joint effort of Grupo Salinas, Fundacion Azteca and Kybernus in partnership with Sakal Media Group and Delivering Change Foundation. Delivering Change Foundation has partnered with Groupo Salinas in Mexico to launch the Tanishka Foundation which focuses on women’s dignity and the critical role of taking women to the core of Nation Transformation. The program has been initiated successfully with delegations from both DCF and TWP visiting each other’s respective countries to closely align themselves towards understanding how the Tanishka model can be replicated successfully in Mexico.